Those of us in the Slow & Steady subgroup of the BBA Challenge might still be in the "C" section of Peter Reinhart's book, The Bread Baker's Apprentice (on our way to the end of the alphabet - and the book!) but we're not discouraged, nope, not one bit. We've been too challenged by the current bread, Ciabatta, to even notice that several more breads are still ahead before we escape the wily grip of the third letter of the alphabet. Ciabatta is a rustic hearth bread which hails from Como, Italy - it takes its name from the region's dancing shoes which it vaguely resembles. 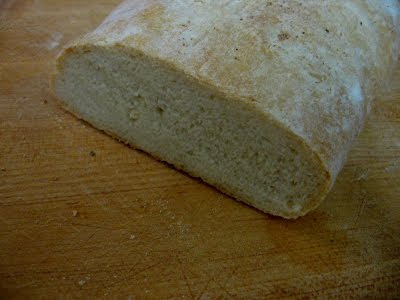 Aside from that flat slipper shape, Ciabatta is also characterized by large shiny holes in the crumb. The loaf pictured up top demonstrates the holey nature; in fact that one is pretty much one big hole surrounded by crust! 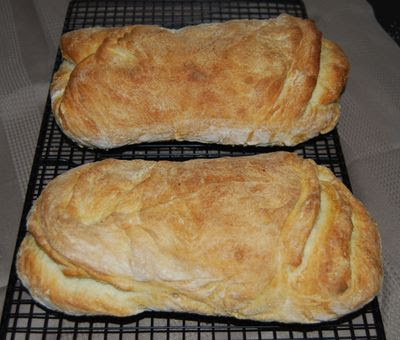 Now before anyone gets their hopes up and/or becomes despondent, that loaf in that picture was not baked by anyone in the BBA Challenge; it is a loaf of Ciabatta that I bought at a local bakery (Ciabatta accompanies dinner at our house nearly every evening). To a greater or lesser extent, all of us had the goal of baking our Ciabattas with large holes. Read on to see how we fared in our quest. 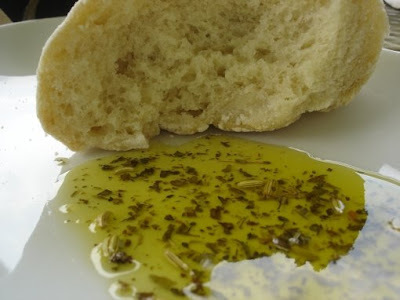 Kayte of Grandma's Kitchen Table was delighted to find that her bread looked exactly like the dancing slippers from the Como region of Italy that give this bread its name, and her family was delighted with the taste of the bread, dipped in herbed olive oil (yum!). She's already plotting to try this bread again, to see if she can get, guess what? Right, bigger holes! 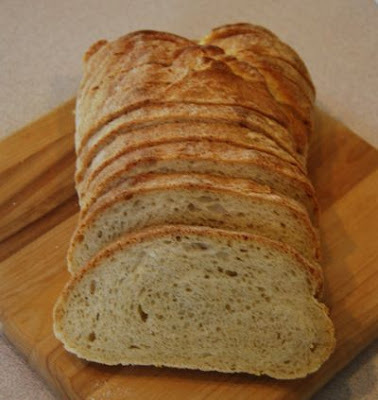 Her post: BBA: Ciabatta. Jessica of The Singleton in the Kitchen had stiff competition from some amazing restaurant Ciabatta as her benchmark; luckily her version garnered compliments from her brother. She has made Ciabatta in the past from another recipe, so I'm attributing the sizeable holes in her bread's crumb to the practice she's had! Read her post: BBA SOS: Holla for your Challah! Welcome to a new member this week, Margaret of Tea and Scones, who found that her bread was wonderful for dipping in flavored olive oil (check out the fennel in that picture - tasty!). She's hoping that a bit of practice will produce, say it with me - holes! 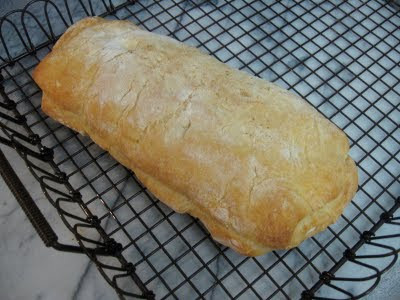 Her post: Slow and Steady BBA - Ciabatta! Cathy of The Tortefeasor, despite the restrictions of One Sentence Blog Post Week, managed to describe three lessons she learned from her "insanely delicious" bread; her post served as a reality check to me and is a fitting reminder as I conclude this round up that when a bread is as good as this ciabatta was for nearly all of us, the hole size really shouldn't matter! We will be back on the sweet side of the bread street with our next challenge: Cinnamon Bune and Sticky Buns. Look for the roundup here in about 2 weeks. Well done !! I 'm running as Bolt to catch you and today I baked casatiello and challah few days ago I finished poor man's brioche and ciabatta ! !Tomorrow I'll write my post and be even but with lots of bread, fatter and shortbreathed ! Such fun to see everyone's breads all together like they are at a party...comparing this outfit to that one, to the other...oohing and aaahhhing...LOL. Way way jealous of all those with the big holes, let me tell you. I will NOT let this be my siren song, I will keep at this until I too can say, "Oh, yes, the large holes are lovely, aren't they?" Thanks for putting this all together, such fun, and I love baking with this little subgroup! This was fun. Looking forward to the next one. Glad to see SOME had luck with the holes!!! thanks for doing this Nancy. Dear Nancy I made it ! I can't wait for the slow pace of Cinnamon sticky buns !! Wonderful roundup! I've been entertained by baking through this book, because not all of them are really home runs and I think my expectations were a bit too high. But I really can't wait to get out of all the enriched breads as well! Everyone's breads look great - wow Di, look at those holes!! !